DescriptionOrganic shea and mango seed butters with our exclusive ‘Himalaya-Rainforest Oil’ of goji berry, acai and urucum seeds, and other special oils, add to the pure vitality of this live antioxidant, vitamin and enzyme moisturizing mask. 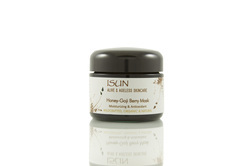 An infusion of vanilla and cardamom essential oils add a feeling of sensuous warmth to this mask treatment. For best results, apply all over face generously and leave on for at least 30 minutes. - Apply to cleansed skin including around eyes. Leave on for 15 minutes or longer before rinsing. Use as often as desired.